Once again, I haven't posted in a couple of weeks. This seems to happen a lot when I travel for work and fun. Where was I last week? Boston. I absolutely love this city. From the amazing accents to the food and culture, this is my kind of city. If you follow me on instagram, you would see some of my week through pictures. I feel like my week was consumed with a ton of work. I am talking running around Massachusetts for three days straight incurring toll after toll. I must have hit at least 20 tolls in one day alone. When I wasn't working, I was walking the city (Back Bay area), eating and taking in the alarm 9 fire that took place. Let me just say, it was devastating. Boston weather wasn't too bad (32 degrees to 45 degrees), but it was very much colder than Reno weather (right now). Plus the wind chill each day added to the bitter coldness. This Spring-like winter in Nevada has made me a wimp when it comes to colder weather this year. 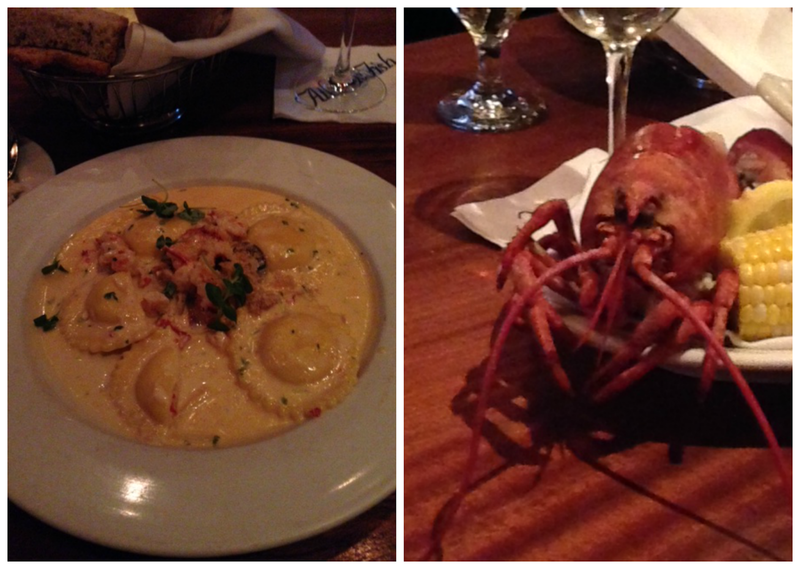 Here are some places/restaurants/events from my Boston trip... I traveled all day Monday, so the only thing I did other fly was go to Atlantic Fish Company. I went to Atlantic Fish Company on my first trip to Boston several years ago, and was hoping it would still be as good as last time. It was still as amazing that I went twice. I did not take any photos that night, but I had a cup of their clam chowder and half a dozen oyster plus their fresh bread. Let me tell you, the Blue Point oysters were some of the biggest, hearty oysters I have ever had. So good. Tuesday was a day on the road where I found myself in Marlborough, MA and found this cute coffee shop that had the best lattes. Tuesday I drove around the western part of Massachusetts and saw a lot of cute old country homes. That night I went to Deuxave. 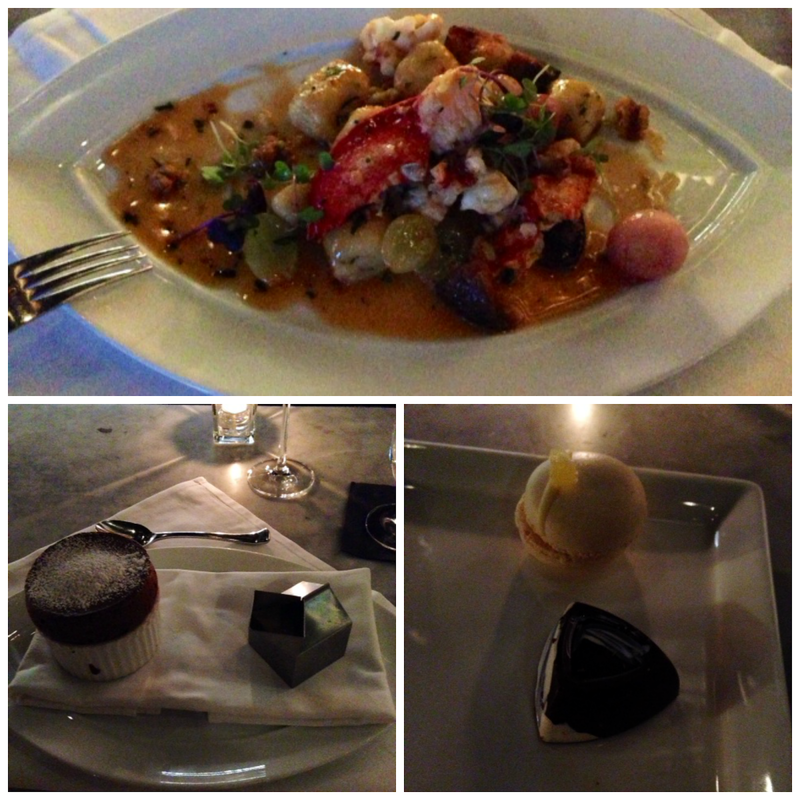 Deuxave is located on Commonwealth Street in the Back Bay area and on the more pricey side, but they had the best lobster gnocchi dish ("Night Moves" Scituate Lobster with Gnocchi). This was a very interesting concoction of potato gnocchi, mushrooms, green grapes, curried walnuts, pearl onions and lobster in a citrus fricassee. 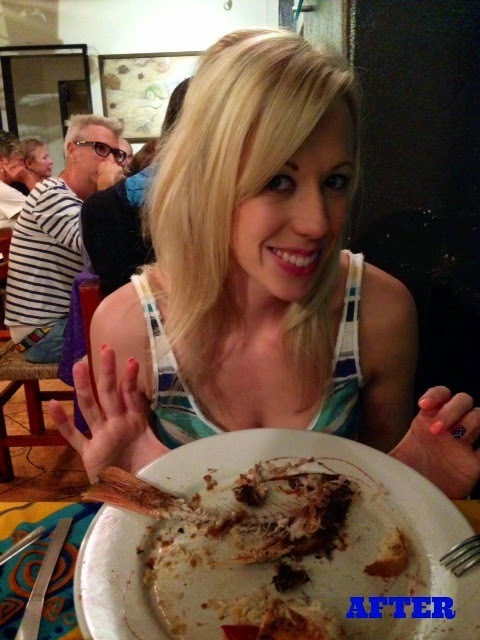 I savored every last bite and would have licked the plate clean if I could have. For dessert (since everyone on yelp raved about it), I had the chocolate souffle' with a decadent coffee sauce. I paired each dish with a glass of pinot noir recommended by the bartender. As a finisher, they give you a dark chocolate truffle and mini macaroon. I loved the macaroon as it was a light and fluffy grapefruit morsel. Wednesday I stayed in Boston most of the day, but I did head out west a bit in the morning. The weather was calling for 2 to 4 inches of snow that morning and there was maybe a dusting. I was very happy about this as I didn't want to drive in the snow in a city/town where I didn't know my way around. The bad thing....freezing wind chill and the fire that started around 3 pm. 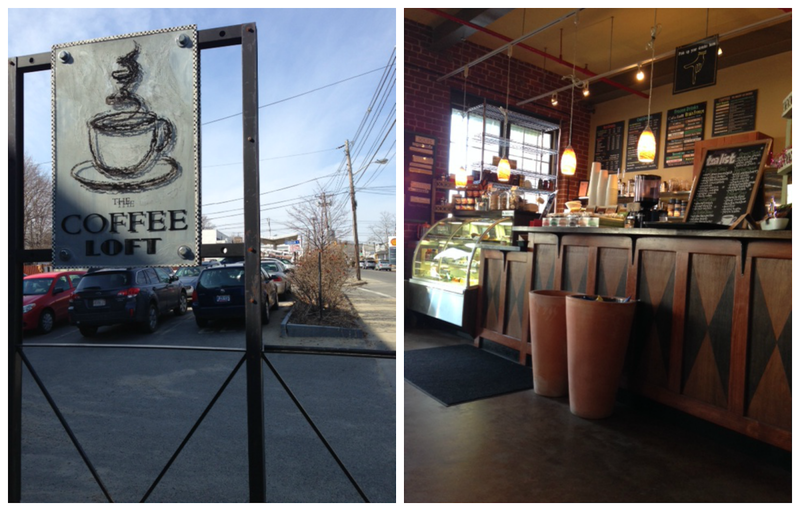 The morning started off in Sudbury, MA at Karma Coffee. This was another cute coffee shop that roasts their own beans and had the cutest little mascot. I really wish I would have bought a traveler coffee mug since they were cermanic with a leather sleeve, but I figured I couldn't fit anything in my suitcase with how much stuff I packed originally. I did manage to go shopping and stuff even more in my overflowing bag (my husband took the big suitcase on his 4 day warm weather work trip, and I had the smaller carry on for my 5 day winter work trip). Isn't there mascot/icon so cute? That evening I came back into Boston with a lot of smoke, a bunch of closed roads and chaos near my hotel. 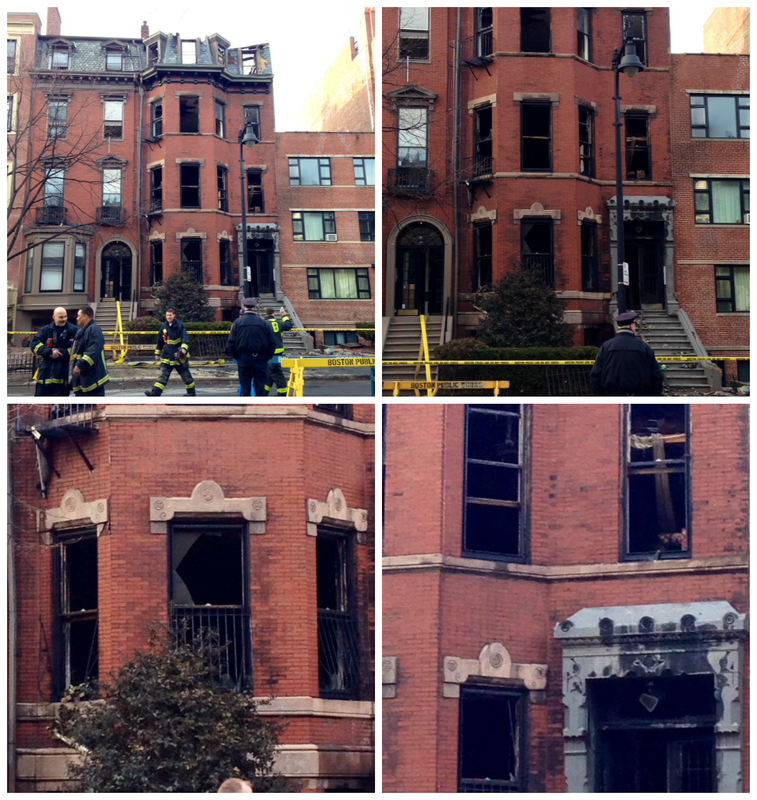 I was on Exeter Street in the Back Bay and the fire was on Beacon Street (between Exeter and Fairfield). The fire was literally a couple blocks up from my hotel. The smoke was really thick and I couldn't help myself, but to walk as far as I could to see the fire. Wednesday at 6 pm-ish This was an 9 alarm fire which is one of the worst fires. I watched in horror that day, night and the next day learning about how bad this fire really was. They could not go in (they did only for a brief time which fatally injured two firefighters) and had to fight the fire from the outside. This was truly devastating to see. Wednesday night I ate at The Salty Pig. If you love pig products, pizza and cheeses, then this is the place for you. I just wish I had more people with me to order more things from the menu. I started with a charcuterie plate recommended by the bartender. It came with some mustard, pickles and crostini. I don't remember the names of the meats and cheeses, but they were spot on. Then I had their wood fire pizza. The pizza was thin crust, fresh mozzarella, basil, tomato sauce and prosciutto. Again, it was very good, and I couldn't even eat half since I had the charcuterie plate. My husband would LOVE this place. Thursday I ventured out north (almost to New Hampshire). When I got to my hotel, I went to see the carnage of the fire. DEVASTATING. RIP Michael Kennedy and Edward Walsh, Jr. For dinner I had, you guessed it, Atlantic Fish Company. Now I know there is so many amazing Boston restaurants to go to, but I hadn't had their lobster raviolis that I loved so much last time. They were equally as good as last time, but this time, I added a side order of lobster ($16) recommended by the bartender. Lobster Ravioli and a side order of lobster (when in Boston...) After dinner, I walked to J.P. Licks for some ice cream which was the perfect ending to my lobster dinner. 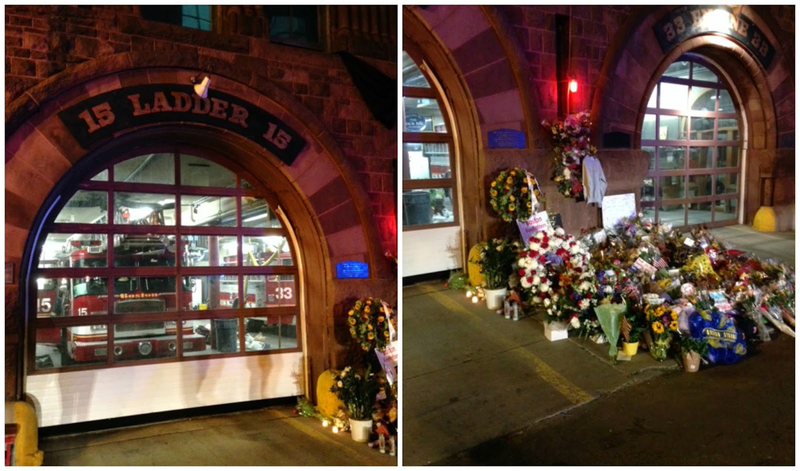 Along the way, I walked by Ladder 15 Engine 33 fire station. Friday I flew home, and was very happy to see Walter the dude and my husband. Here is a cute picture of Walter last night after his bath to liven the mood just a bit. I would say my Boston trip was a success and I can't wait for my next work adventure. 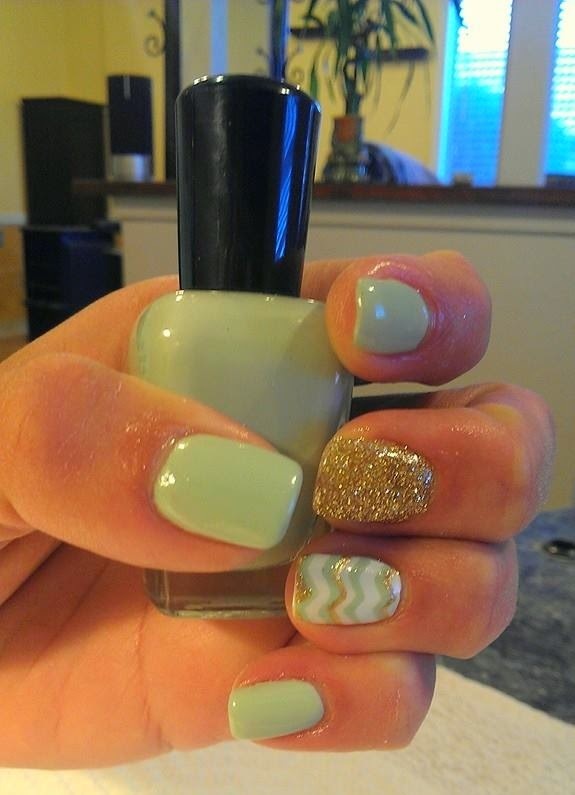 I love everything about these: mint, gold, chevron and glitter. What more could a girl ask for in a manicure? What is your favorite spring color nail palette?